Burgeoning school rolls across Edinburgh have precipitated a wave of new building as the city scrambles to keep pace with demand, necessitating the expansion of existing accommodation combined with new build alternatives. 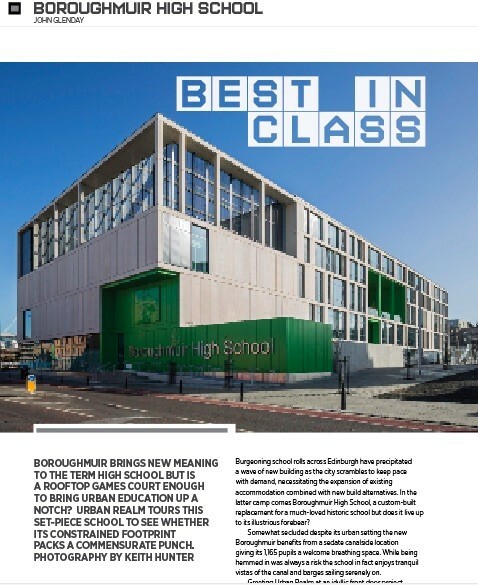 In the latter camp comes Boroughmuir High School, a custom-built replacement for a much-loved historic school but does it live up to its illustrious forebear? 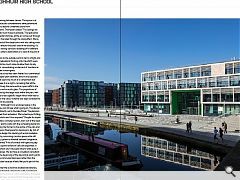 Somewhat secluded despite its urban setting the new Boroughmuir benefits from a sedate canalside location giving its 1,165 pupils a welcome breathing space. While being hemmed in was always a risk the school in fact enjoys tranquil vistas of the canal and barges sailing serenely on. One potential pitfall for many urban schools is the lack of readily available land for expansion, an issue which has reared its head rather sooner than might have been hoped at Boroughmuir with widely trailed reports that it is already at capacity, prompting a look at the feasibility of expanding further along Dundee Street with a potential satellite building for occupation by a sixth form or upper school. As well as facing a constrained footprint the architects also had to devise a way to bridge a substantial change in level from the canal at one end to Dundee Street at the other, although this latter constraint actually worked to the projects advantage by utilizing the drop to tuck plant equipment neatly out of sight within the slope. 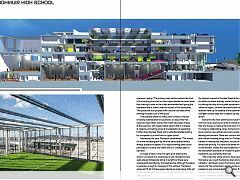 Low level classrooms and north facing sports facilities make up the balance of the basement footprint, with rooflights tucked deep into its depths by way of a full height atrium. Above this the main entrance and social hub sits on the first floor level, opening out onto an impressive main space that was the key to making the build work in terms of usage by merging collaborative zones, dining and mobile private study nooks in one central volume to provide a more friendly learning environment. There was concern about open balconies and children throwing things over but Thompson says he is a believer in treating kids like adults, but you’re so exposed it’s almost self-policing. You have to be aware of leaving things on the handrail. Indeed the only trouble thus far has been the inadvertent activation of fire alarms sparked by heavy deodorant use, prompting their ban. While connections to the outside world in terms of light and views are welcomed elevations fronting onto Viewforth were found to be subject to too much noise to allow them to rely on natural ventilation, necessitating an element of mechanical ventilation to eliminate noise ingress. In appearance the school has been likened to a commercial office block with its open plan aesthetic, atrium and exposed concrete. It might not seem like much of a compliment but Thompson doesn’t take it as a slight, conceding that all the classrooms are effectively the same with an open soffit to the underside of the slab and acoustic glass. The proportions of each room are defined by the large voids within the plan, with sports halls specified to be a specific height which then had to be built around. Even the colour scheme was kept consistent to provide as light a finish as possible. Thompson said: “Although it’s an enclosed space in the middle of the plan you can still see what’s going on. The dance/fitness studio looks directly out to Dundee Street. The planners were looking for street front activation. 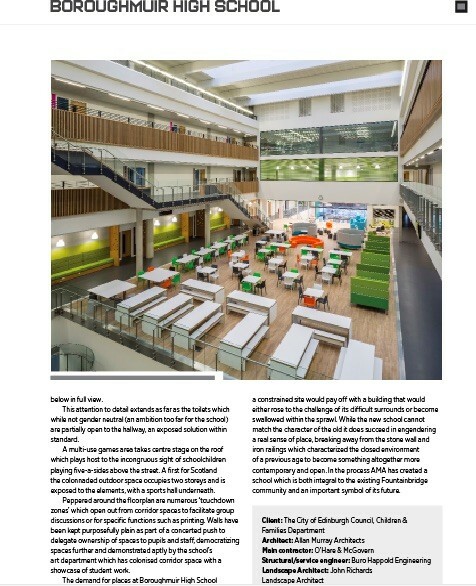 We’ve had to put fritting on the glazing so the kids aren’t too exposed.” Despite its simple massing the school has a complex section, born out of the need to juggle atrium and sports voids with the competing demands of classrooms, pushing the former to the centre of the plan and freeing up prime exterior floorspace for classrooms. By dint of necessity as much as design this stacking of accommodation boosts connectivity by minimising corridor space while still operating a one-way system to forestall stairwell congestion. In descending order the school has located laboratories, languages, art and technology classrooms with a prominent staffroom that sits like the prow of a ship overlooking the melee below. Thompson had been concerned that the teachers would shut themselves away from the madness for a well-earned break but the blinds are in fact kept open, placing everyone below in full view. This attention to detail extends as far as the toilets which while not gender neutral (an ambition too far for the school) are partially open to the hallway, an exposed solution within standard. 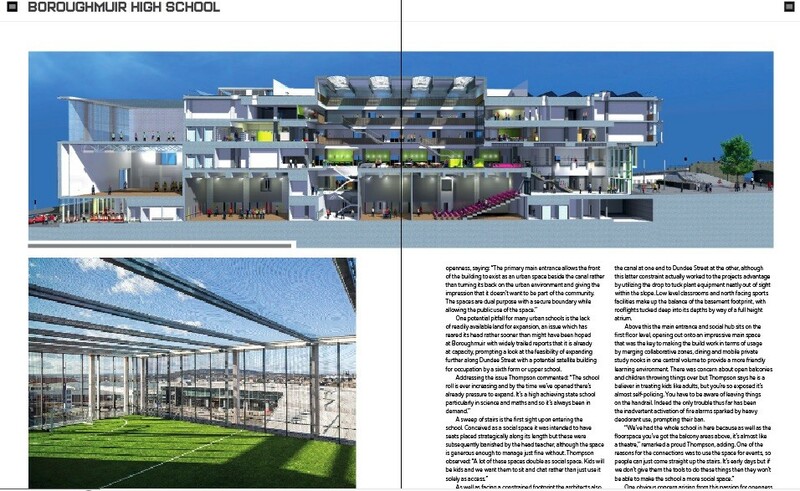 A multi-use games area takes centre stage on the roof which plays host to the incongruous sight of schoolchildren playing five-a-sides above the street. A first for Scotland the colonnaded outdoor space occupies two storeys and is exposed to the elements, with a sports hall underneath. 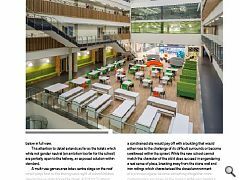 Peppered around the floorplan are numerous ‘touchdown zones’ which open out from corridor spaces to facilitate group discussions or for specific functions such as printing. Walls have been kept purposefully plain as part of a concerted push to delegate ownership of spaces to pupils and staff, democratizing spaces further and demonstrated aptly by the school’s art department which has colonised corridor space with a showcase of student work. 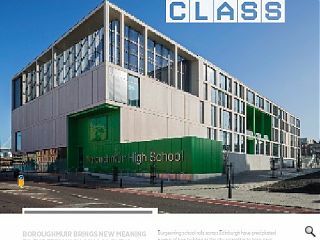 The demand for places at Boroughmuir High School speaks for itself but it was not clear that migration to such a constrained site would pay off with a building that would either rose to the challenge of its difficult surrounds or become swallowed within the sprawl. While the new school cannot match the character of the old it does succeed in engendering a real sense of place, breaking away from the stone wall and iron railings which characterized the closed environment of a previous age to become something altogether more contemporary and open. 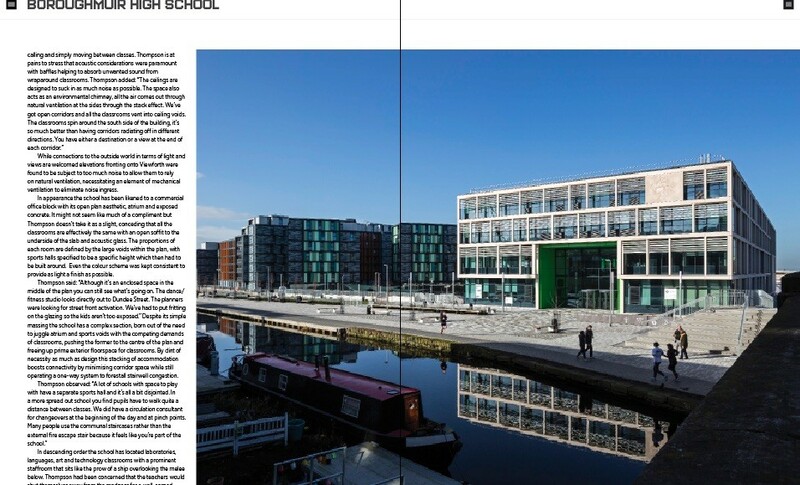 In the process AMA has created a school which is both integral to the existing Fountainbridge community and an important symbol of its future.